﻿ FIDEX Multi-Modality Veterinary CR/CT/Fluoroscopy Scanner from Animage. White Papers. Is the FIDEX Scanner Fast Enough? Does a Flat Panel Detector Have Enough Bits for Veterinary CT? Is FIDEX fast enough for veterinary CT? All CT scanners require the patient to lie perfectly still during data acquisition. Human CT scanners resolve this problem by asking the (human) patient to hold his or her breath, and by running the scanner at very fast rotation speed. For cardiac CT, they work with ‘gating’, meaning they synchronize data acquisition with an EKG signal. Nevertheless, motion artifacts still occur even with very fast CT scanners. FDCT data acquisition takes about 10 sec for a gantry revolution due to a current limitation in flat panel technology. Therefore, it is fair to ask the question: how one can make veterinary CT images free of motion artifacts. And a second question: how long does it take to scan a dog from snout to stifle? This paper addresses both questions, comments on principal limits, and gives a short outlook of what is in the FDCT pipeline. How fast can FDCT scan along the axis of rotation? Is it fast enough for contrast studies? 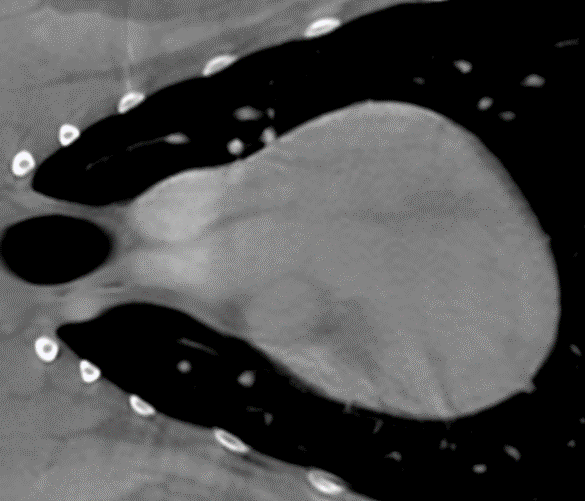 Can we do cardiac CT with FIDEX? What can be expected from the technology in the future? The goal is to avoid motion artifacts. Even small movements of the patient during data acquisition produce inconsistencies in the data, and that causes streak artifacts along bones or general blurriness of the image. Depending on the body part to be imaged it may be OK to sedate the animal and tape it firmly to the patient table. This has a good chance to work for extremity scanning, and potentially for lower body parts such as the hip or urinary tract. As shown in Section 3 below, a body scan with FIDEX may take several minutes. The operator has to make sure there is no motion of the body parts to be imaged during this time period. In general, we recommend complete anesthesia with intubation. This allows for the controlling of the breathing motion. For scanning the head in high resolution, and definitely for scanning the thorax and the central part of the abdomen, anesthesia and intubation is required to permit breathing control. Even anesthetized and intubated patients will breathe spontaneously, making thorax scanning problematic. The diaphragm will move several cm during a breathing cycle, thereby severely impacting image quality. The proper way to control breathing is with the use of a mechanical ventilator. Animage has worked extensively with Hallowell, Inc. and developed a patent pending technique of synchronizing the breathing cycle with the data acquisition cycle. This is called ABCTM (automated breathing control). During preparation times, the ventilator will breathe the patient at the set rate, volume and pressure. As soon as the scanner signals an upcoming scan start, the ventilator will finish the present cycle and go into a hold mode at inhalation. At the end of the data acquisition cycle, the ventilator will resume breathing of the patient. It has about 10 sec to do that while the table increments and the scanner gets ready for the next data acquisition. Therefore, the speed requirements on the scanner, as far as breathing is concerned, are not difficult to fulfill. Patient comfort is not impaired by a 20 sec pause in the inhale state. 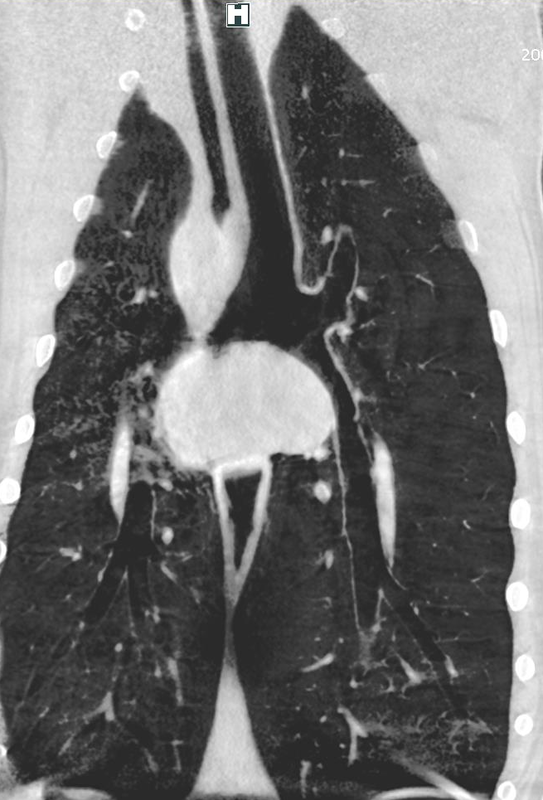 Lung CT without breathing artifacts (slice image on the left, slab MIP on the right). Motion artifacts are one aspect associated with scan speed, and as we saw above, the main issue – breathing – can be handled quite well with the Animage/Hallowell synchronized ABCTM ventilator. Other patient motions like heart beat or intestinal motions cannot be controlled, but they usually do not lead to bothersome artifacts. However, one must consider the total scan time for reasons of anesthesia duration, and patient throughput with planning. FIDEX, for example, can cover 8cm per gantry revolution in most scan modes, with some overlap used for image stitching to obtain a seamless volume image. If we consider a typical spine or abdominal scan of 30cm scan length, FIDEX will need 4 gantry revolutions for this, plus 3 table increments. This adds up to about 95 sec. Large patients will requires about twice the time, or 3 minutes. Is that fast enough to follow a bolus of contrast? This appears to be well suitable for contrast scanning, and it is an acceptable examination time which compares well with legacy CT scanners. For example, a single-slice spiral CT scanner would need 300 sec or 5 minutes for the same scan length. 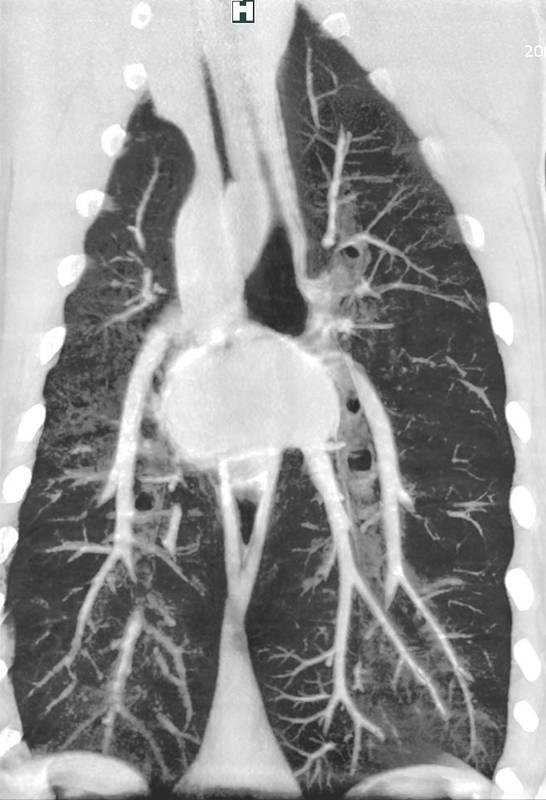 As shown above, FDCT scanners are too slow to freeze heart motion in CT. However, one can get reasonable heart scans with iodine contrast if the heart rate is slowed down, see below (left). Obviously, one cannot distinguish coronary arteries in this image. 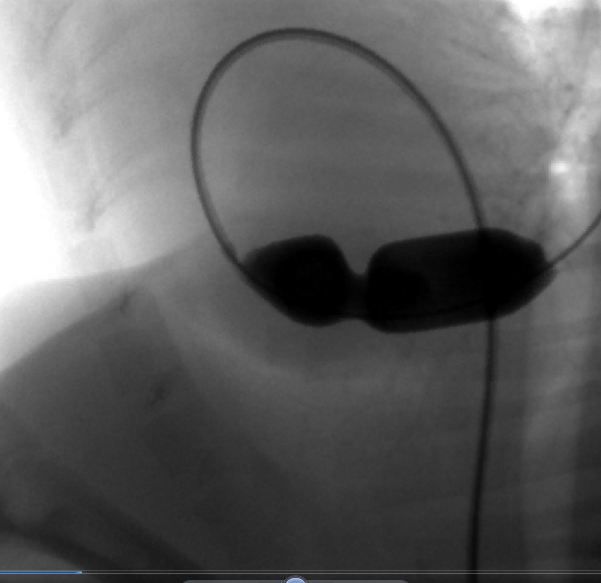 In general, the heart is only accessible through fluoroscopy, as shown on the right (pulmonary valve stenosis). With FIDEX fluoroscopy, one can run at up to 60 frames per second, plenty fast enough for cardiac studies. 5. What Will Come Next? The bottleneck in terms of acquisition speed is the flat panel. Today, these devices are limited to a maximum 60 fps (frames per sec). If flat panel manufacturers succeed in designing faster readout, FDCT can immediately profit from it. FIDEX has already integrated the most promising technology by introducing CMOS panels (as opposed to thin film TFT panels) in its latest product. In addition there is very promising work being done on iterative reconstruction algorithms which aim to reconstruct CT images from fewer projections. The driving force behind this is the desire, in human scanning, to save dose to the patient. Reducing the number of projections is a good way to do that. So even if the flat panels cannot be sped up much, overall acquisition time may come down substantially. Thirdly, with some change to the hardware, one can apply slip rings and spiral scanning to FDCT just as it is used in MDCT (multi-row detector CT). This will essentially speed things up by another factor of two because it eliminates the wait time for the table increment. Together, these three technical improvements will allow scanning the 30cm body in a breath hold of 20 to 30 seconds without changing the concept of FDCT. It should be noted that FDCT is a new technology, and rapid progress is to be expected in the next years. One new and exciting hardware implementation is the use of industrial robots to position the tube and the detector panel at arbitrary positions, opening a whole new set of scan modes. Expect to be impressed, but give it some time.